ABOVE: V.I.A. 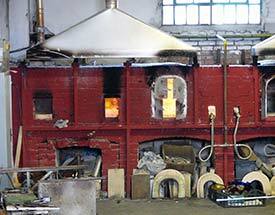 's glass furnace on Murano. INSET BELOW: A factory showroom, the V.I.A. factory entrance, and a barge filled with waste glass. Master glass artisans have spent years refining their proprietary techniques and don't want competitors taking notes. From the Colonna waterbus stop, turn left as you exit the boat platform and walk along the water until you reach a "Fornace Glass" sign on a door below the Calle S. Cipriano street sign. Pass beneath the "Fornace - Entrata Libera" entrance sign, follow the sidewalk, and enter the factory to view a free glassmaking demonstration. (Afterwards, you'll exit through the showroom.) The demonstration takes less than 10 minutes, but it's interesting if you haven't seen a glass furnace. Look for open factories on weekday mornings. Don't count on much action during the lunch hour (which can run from noon or 1 p.m. until mid-afternoon). If you're a serious glass collector or buyer, you may be able to visit some of the more artistic fornaci by appointment. we'd suggest making arrangements through a gallery, dealer, or decorator who has contacts in Murano. To phone or correspond with workshops directly, buy Michela and Nicoló Scibilia's Comprehensive Guide to the Island of Murano (see page 8 of this article) and use the listings in its "Production" chapter as a starting point for your planning. Top photo copyright © Richard Goerg. Bottom inset photo © Nickos.